We encounter our share of unique situations in the property restoration business. Sometimes we are challenged by the uniqueness of a structure or space and sometimes, it’s the packing and storing of the contents which presents the biggest hurdles. Last spring our challenge was not only an interesting space to clean and restore but we also had to work within some pretty strict time frames. The Chicago White Sox experienced a fire in a warehouse just hours before they were opening up U.S. Cellular Field to 40,000 fans on one of the busiest days of their year. If this warehouse had been in some remote industrial park it would’ve been just another headache and there wouldn’t be much of a story. But this particular warehouse happened to be located within the stadium itself. What the public doesn’t usually see is the inner circle of the stadium which is laid out in a large circle with a series of offices and warehouses making up the perimeter which are all connected by one large hallway. This is significant because the origin of the fire was literally only steps away from offices and locker rooms. In addition to the close proximity of key areas within the stadium, the warehouse was unique because it provided the only access between the first base dugout and the batting cages for the visiting team. Initially, we needed to dry out the space quickly so that the visiting team could access the batting cages. We used commercial fans and air-scrubbers with Hepa filters to clean up the air. After we addressed the emergency response work in those first few days, our crews worked early mornings, evenings and weekends – anytime the White Sox weren’t at home. We made sure we didn’t disrupt any further operations. 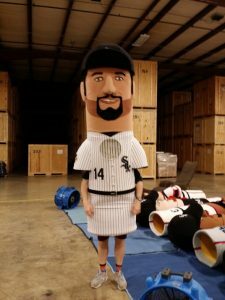 Working with a professional sports team like the Chicago White Sox required us to remain flexible. Typically, the next phase which is cleaning and restoring contents is done all at once and on our timeline. However, the White Sox needed items cleaned and returned in a particular order so they would have the right promotional items and merchandise for the corresponding games. Although it did spread out the demand on our cleaning crew, it also required extensive record-keeping. We met the challenge and in the end, we were able to preserve opening day for this beloved South Side team as well as save them thousands of dollars by cleaning and restoring branded promotional items and merchandise. It’s all in a day’s work for us here at Midwest Restoration, but it’s not every day we clean and restore a major league baseball team’s merchandise so it makes our work just a little bit more fun for our team members!